Vera Deacon was Guest Speaker at the 2012 International Women’s Day Dinner held on the 9th March 2012. The Event was sponsored by the Newcastle Branch of the Union of Australian Women and held at The Adamstown Club Brunker Road Adamstown. 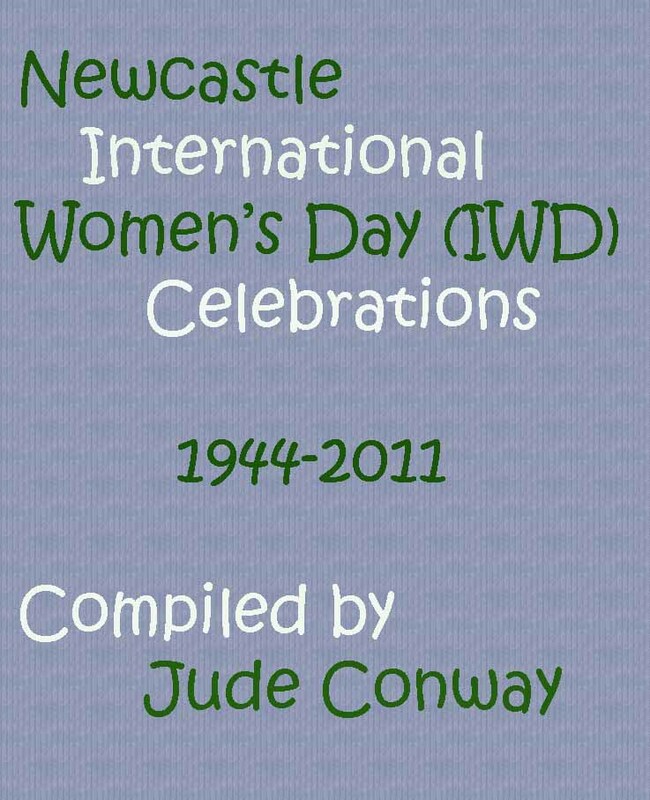 Her speech covered the followed topics including Prime Minister Julia Gillard and the current toxic state of politics and political debate in Australian media, University published book ‘100 Women’, Dr Jean Talbot, Donna Meehan, Hunter Valley and its ongoing care, 101st Anniversary of International Women’s Day, Winning of the Women’s Vote in Australia, Rose Scott, Scott Sisters, Ash Island, Women’s Suffrage Movement, History of Women’s Vote in Australia, ‘My Brilliant Career’, Vera’s early years, Woodstock Street Oakley’s Paddock, Hanbury Street Mayfield, Midwifery, Nurse Whiteman’s Lying In Home, Father works at BHP Coke Ovens, Family moves to Dempsey Island, then Mosquito Island, Labour Movement, Depression Camps, Platt’s Channel, Shortland Camp, Mayfield West Camp, Dole, Vera’s pedigree convicts Irish Catholics bullock driver, Aunty Nola Hawken, Awabakal People, convict women on Nobbys, Lysaghts Girls, Josephine Conway, Marilla North, Janet Copley, Charlie Skene, Vera’s father’s life, Big Ben, Soviet Union, Min Wilson, Communist Party of Newcastle, Socialists, Feminists, Reading, Migrants, Jessie Street and The Women’s Charter, Stockholm Appeal, Ban the Bomb, Dorothy Hewett, Nuclear tests and diseases of Children, Peace, Germaine Greer and the struggle for women’s rights across the world. A Lyrical Afternoon in celebration of the life and work of Norman Talbot, Dorothy Hewett and Merv Lilley was held at Varuna, The Writers’ House in Katoomba, on the 15th September 2012. The first part of the afternoon was dedicated to honouring the life and work of Norman Talbot. Presenters included Dr Jean Talbot, Don Cohen, President of Catchfire Press, Dr Christopher Pollnitz, Jo Tregellis and Zeny Giles. Followed by Jean Talbot and Don Cohen reading The Pinkerton Haiku. 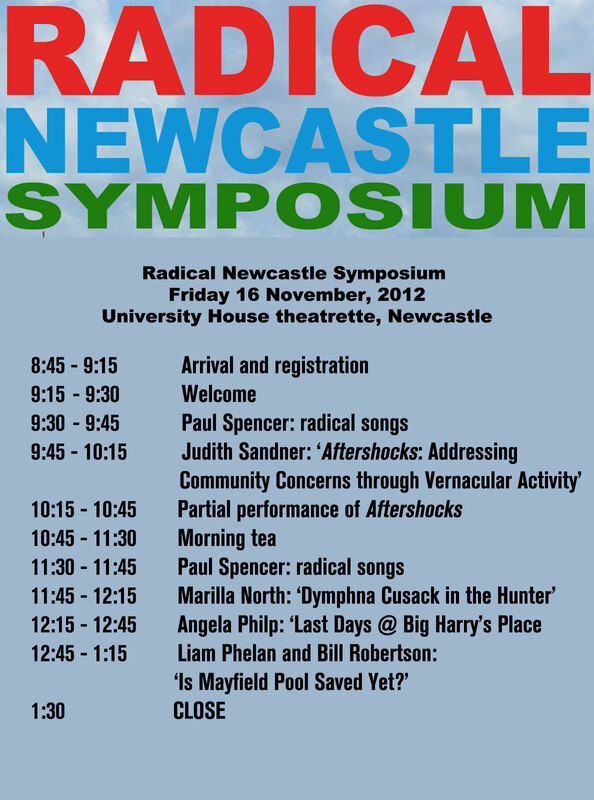 In addition to the Tribute, the Newcastle Poets also presented readings from recent works as part of the Event. Running order for this segment was Jo Tregellis, Dr Christopher Pollnitz, Zeny Giles, Don Cohen and Dr Jean Talbot. The second part was dedicated to honouring the life and work of Merv Lilley. 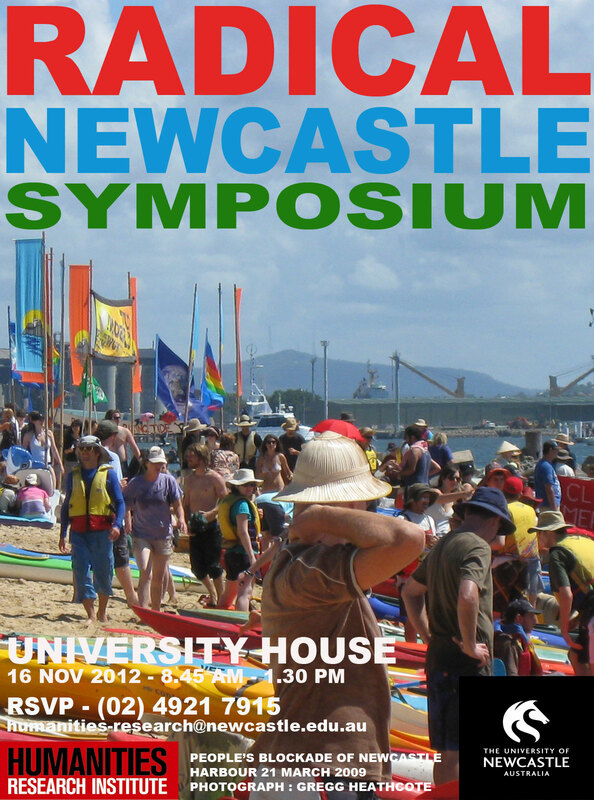 Presenters included Rozanna (Rose) Lilley, Marilla North, Tom Flood, Joe Flood and Adele Flood. Rose : From What About the People? The third and final part of the afternoon was dedicated to honouring the life and work of Dorothy Hewett. Presenters included Rozanna (Rose) Lilley, Rosie Scott, Tom Flood, Joe Flood and Adele Flood. At the end of the day was heard the most beautiful Australian song ever written. 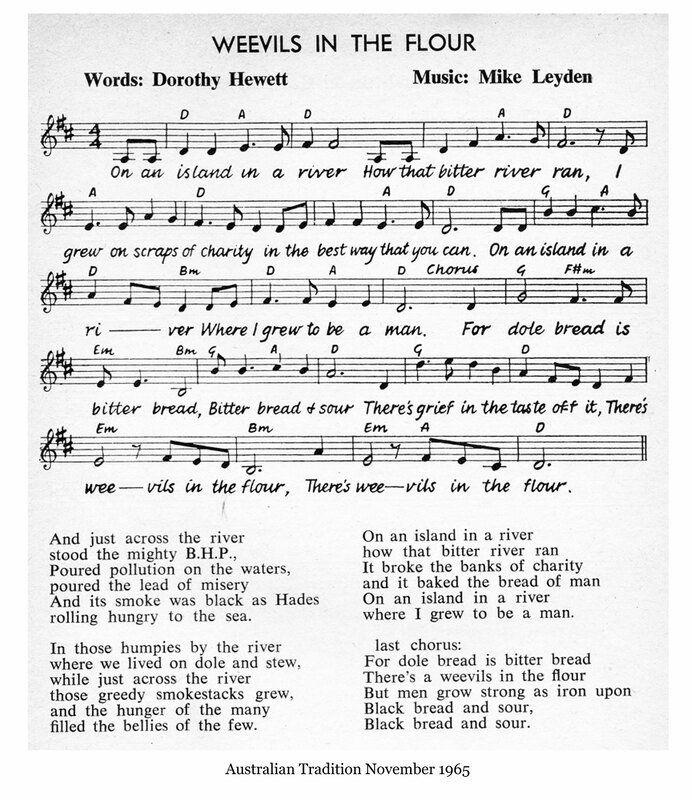 A poem by Dorothy Hewett in 1963, set to music by Mike Leyden in 1965. Based upon the reminiscences of the Great Depression by our own local treasure Vera Deacon. The “island in the river” is Moscheto Island that once stood in the Hunter River, the BHP was own BHP, the Humpies were those on Platt’s Estate. Please read Weevils in the Flour: A short history of a song by musicologist Mark Gregory. Also included is a note about the new setting of Black Strike (Clancy & Dooley & Don McLeod) relating to the first strike . Mark Gregory, in conversation with Marilla North, has referred us to the eminent Julian Croft’s (of University of New England) paper he did back in 1999 – “A Sense of Industrial Place” published in ANTIPODES Vol 13 No 1, June 1999. Croft nominates Newcastle as “the world’s first industrial city” and asserts that it was “atypical of the usual construction of Australian place”. He further asserts that proper parallels for the shaping of Newcastle should be made with Stuttgart, Birmingham and Pittsburgh. One of Mark’s discovered heroes is “Frank the Poet” who has his own link: http://www.frankthepoet.com who actually was a convict sited in Newcastle over 1837/1840 and who wrote four poems in or near Newcastle c 1838. I’d love to be there with Malcolm to remember Dorothy and Norman. One of the great joys of my life in the Sydney Realist Writers meetings was to her Doffy, as our little children called her, say her poems in that wonderful, melodious voice…”Have you heard the children singing…” and “Hiroshima, Hiroshima.” Our fifties generation of young mothers was haunted by fear of the atom bomb tests and our children developing leukemia; a fear powerfully real for Dorothy who had lost her little boy to leukemia. 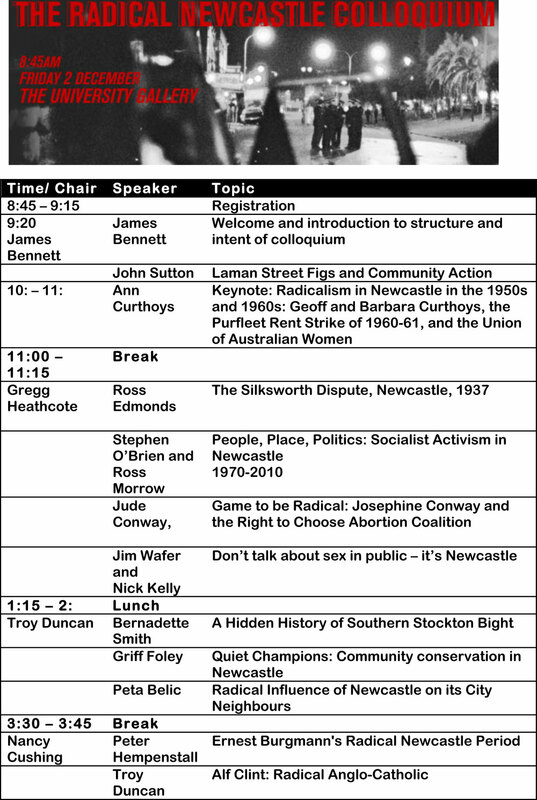 The RWG National Council published Merv Lilley and Dorothy’s collection What About the People. Denis Kevans and I sold that precious collection in the Sydney Domain, when we were invited to recite the poems from various stumps. I treasure a photo of myself, taken in 1964 by an old man, as I spoke from the stump. You can clearly see a copy of What About the People in my hand. It’s seven years since Denis Kevans, Australia’s ‘Poet Lorikeet’, died in August 2005. Ten years since Doffy left us to sleep in that lovely Springwood bushland place. Eight years since I sat with many others, in silent homage to the moving quaker celebration of Norman Talbot’s life. A few years since I heard Merv Lilley and Jean Talbot perform the “Swan River Love Poem” at a hamilton poets’ night. Our memories, our lives are richer for having known them. Now I have kate Lilley’s selection of Dorothy’s poems and so the music of her life and work lives on. Please give Merv and Jean a BIG HUG and greet the members of the Performance Celebration for me. Cheers! Love and Big Hugs for you!! The trees were budding, the birds were singing – the grass was wet – the whole earth was shining. And suddenly I was the trees and the flowers and the birds and the grass – and there was no I at all. – Kahlil Gibran from Mary Haskell’s journal, May 23 1924.
fear of the truth; fear of a hidden Anzac agenda; fear of a genuinely independent assessment; fear of non-independent, dependent, ‘independent’ consultants; fear of the great lie within our chamber of secrets; fear of insurance-driven lack of assurance; fear of mediation; fear of collaborative oneness; fear of the mal in maladministration; fear of the loss of an ethical and moral compass; fear of manipulative blindness masquerading as vision; fear of non-representative representation; fear of institutionalized deceit; fear of unregulated regulators turning a blind eye; fear of a lack of genuine parliamentary oversight; fear of oxymoronic government neutrality; fear of the fig leaf covering our cultural ugliness; fear of Beauty. Ignoramus: ‘Chop them down! Crucify them! Chop, chop, chop! The trees of Laman St were equally beautiful, and Ignoramus killed them. Ignoramus declared Beauty to be dangerous. Beauty might attack his tenuous grip on the tail of Simpson’s donkey. But a strong wind event from the back of the beast might cause Beauty to swoon and fall. Ignoramus cannot imagine do-gooders at Anzac Cove. Nor can he see tree-huggers at Lone Pine. His grand revitalization vision can see only himself, the past universal I reflected back to him from every superficial non-reflective surface. Ignoramus wears his Pyrrhic victory like a borrowed raincoat to protect him from a torrent of contrary Newcastle Voices. In his limited limitless mind Ignoramus is the community. Anybody else is a passing storm of something other, and that other must be a noisy thunder-clapping, lightning minority, no matter how majority that minority may be. Ignoramus does not recognize the Anzac spirit in the Laman St pickets. He does not recognize unity in community. He does not recognize victory in apparent defeat. Ignoramus does not recognize what he seeks to commemorate. Ignoramus destroys what he seeks to commemorate. I hear the choir of birds singing in the canopy at dawn as we nervously await the approach of the centurions. I take one last lingering look: these beautiful figs have fashioned an arboreal cathedral, a sacred grove, a living memorial; they are a parable of unity in community: fourteen living as one. I want to tell them to run away, to uproot themselves and save Beauty for another day. But Beauty does not run. Beauty is too deeply rooted in the poetry in our souls to run. The wisdom of 1930 still rings true. Beauty does not cry out: she submits silently to destruction. Ignoramus crucified Beauty on the cross of her own wood. And yet Ignoramus and Beauty live within each of us. We are all responsible. We are all one. Where is Beauty’s burial place from which hope might spring? There is no resurrection of this crucified Beauty in Laman St but there is surely a resurrection of Beauty in our hearts. Let us shade and comfort each other. And when next we enter the polling booths in the Novocastrian Spring, that time of new life, a new dawn, a newer world, let Beauty cast our ballot, let us uphold an electoral mirror so that Ignoramus may see Beauty reflected. Kahlil Gibran from Mary Haskell’s journal, May 23 1924. Beauty, A Eulogy for Laman St, was written by Paul F Walsh OAM and delivered by him at the Baptist Tabernacle, Laman St, Newcastle, Australia, on Sunday February 26 2012. Susan Harvey of Tusk Productions for creative editorial support and research assistance; Gionni Di Gravio, University Archivist, University of Newcastle, for research advice, research contributions and creative assistance. ‘I Care About Your Happiness, Quotations from the Love Letters of Kahlil Gibran and Mary Haskell, selected by Susan Polis Schutz; designed and illustrated by Stephen Schutz; Continental Publications, 1975 and Coolabah Gallery. Newcastle Morning Herald and Miners’ Advocate, Saturday December 27 1930, ‘Trees and the City’.